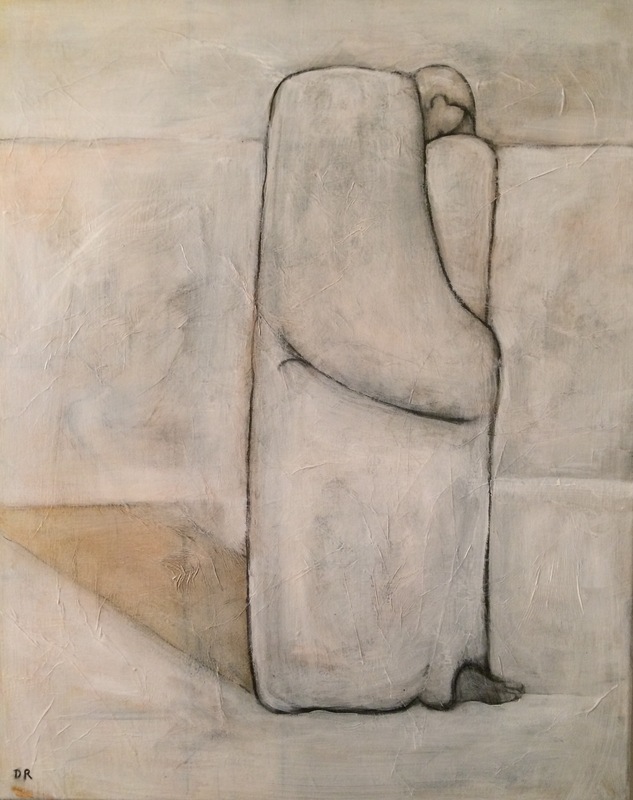 a new painting perfect for winter and inward looking. it’s part of a set in my sacred series. Once, tromping through a biodynamic vineyard, Barney explained to me that winter is the time for the energy of the vine to go to the root. The vine that appears dormant above ground is, in fact, actively recharging below the surface. The energy goes inward. The root rejuvenates, drinking in the minerals necessary for the new growth of the coming spring. The fruit of the summer is impossible without the rejuvenation of winter. We are not so different from the vines though language can trick us into compartmentalizing, perceiving winter as distinct and separate from summer, the inhale as a separate action from the exhale, tides that ebb and then flow. Cycles of life have compartments in study but never in real life. The compartments are made up for the convenience of categorization and conversation. These past few weeks we’ve been cleaning out our house, going through old boxes and files, shredding old bills, carrying furniture and computer carcasses to the curb. Old clothes are going away. Closets and bins are emptied. The house is beginning to breathe. There is space. Spaciousness. We are laughing at old pictures, sometimes cringing. This day’s new-found spaciousness inspires the next day’s cleaning rampage. It is invigorating. Rejuvenating. and this is the other half of the set. 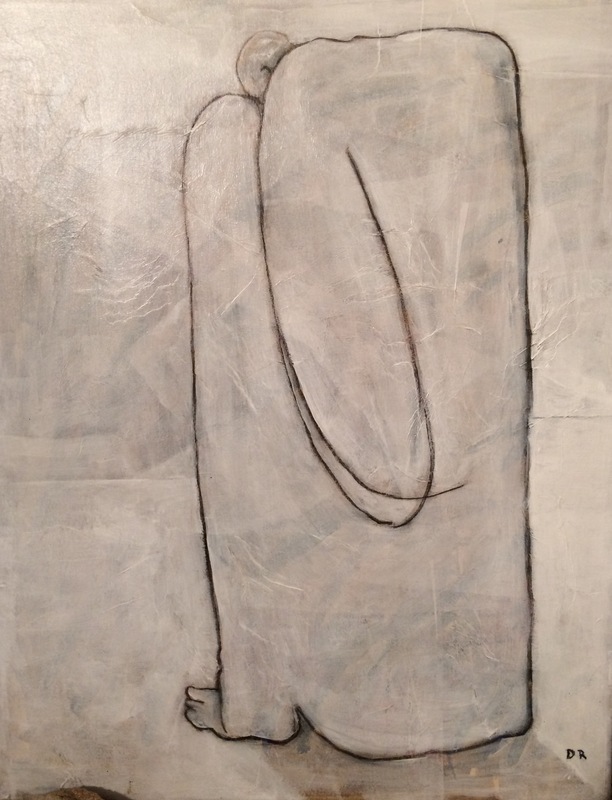 winter has me looking inward and exploring simplicity in line and space. Our cleaning tsunami wasn’t planned. Our computer crashed. Our work was interrupted. Our expression was limited. We complained and resisted and then turned our energies elsewhere. Inward. Going through and releasing old stuff, past lives, creating space, is rejuvenating. We are taking our time. We are going slowly. It is oddly restful. 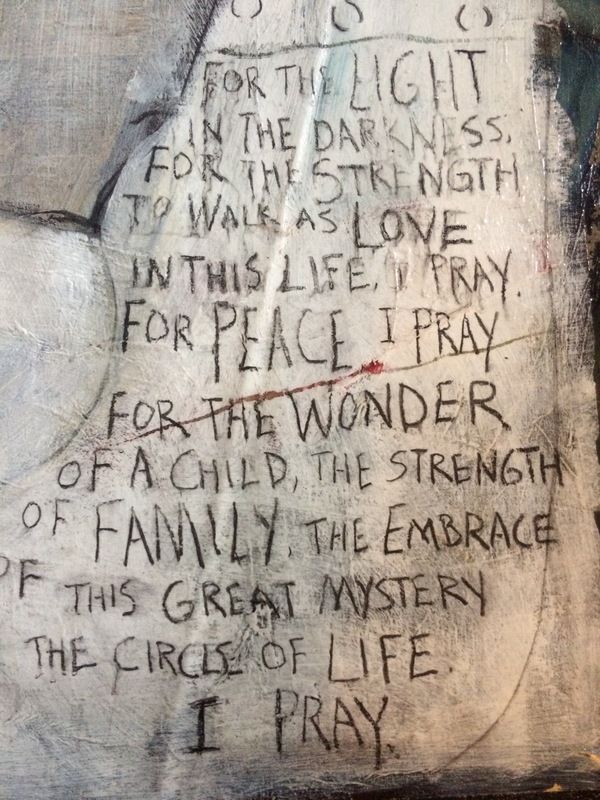 a detail from In Peace I Pray. I grew up with these mountains so it should come as no surprise that I get quiet the moment I step into them. Like a too-tight coat the chaos I wear in my day-to-day life simply drops off; stepping into the mountain is to step out of the noise. Literally and figuratively. Tom once told me that people change when they are ready. Rich once told me that people change when the pain of staying the same grows greater than the pain of making the change. Change when you are ready, change when you are in pain. Skip taught me that a business intending to change people was destined to fail. It is a fool’s errand. Business is about business not change. I loved this bit of advice from Skip because he is a natural-born change agent, a mentor of mentors (and, poetically, entrepreneurs). In a moment of frustration Kerri told me that people don’t change, they simply become more of who they really are. The masks drop off and we unwittingly reveal ourselves. Change as revelation. 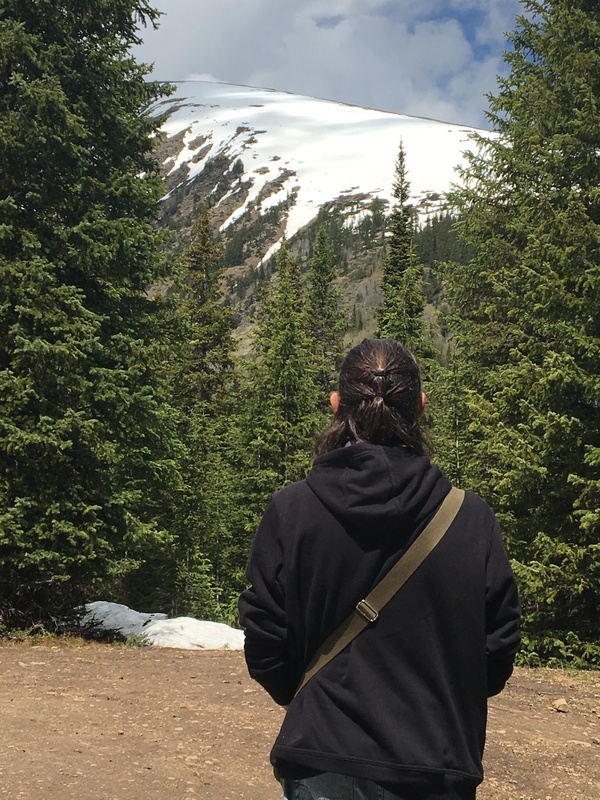 As I hike through the snow toward the summit I wonder if change, at least the human notion of change, is as made-up as the rest of the stories we tell. It is in the forest, which is a festival of the cycles of life, that ideas of different ways of Being seem…superficial. Disconnected. Within seasons there are plenty of changes that roll around and around and around again. Perhaps this thing we call ‘change’ is nothing more than a recognition of the cycle, a readiness to release our dedicated resistance to life? A readiness to release our stories of limitation and division. Toward the end of his life, Joseph Campbell said that he suspected that all life (energy) was consciousness. There is 1) energy and 2) the forms that energy takes. Although seemingly disparate, seemingly separate, all forms fall back into energy. He said, “The universe throws forms up, then takes them down again.”He might have said that change is nothing more than the cyclical movement between energy and the forms it expresses. Jim taught me that the art of acting was the art of being present. I know that when I stand in front of a canvas and begin to work, all notions of time disappear. Another day on the mountain, sitting in an adirondack chair midway up the slope, basking in the sun on warm day, we watched Kirsten snowboard. She flew by us several times. When she rides, it is clear, there is no other place, there is no past or future. There is now. She is vital, alive. In that place, riding the present moment (the only place that actually exists), the noise drops off. I know, and Jim knew, when fully in this moment there is no need to pester yourself with misplaced notions of being somewhere else, being anyone else. a blast from the waaay past: August Ride. 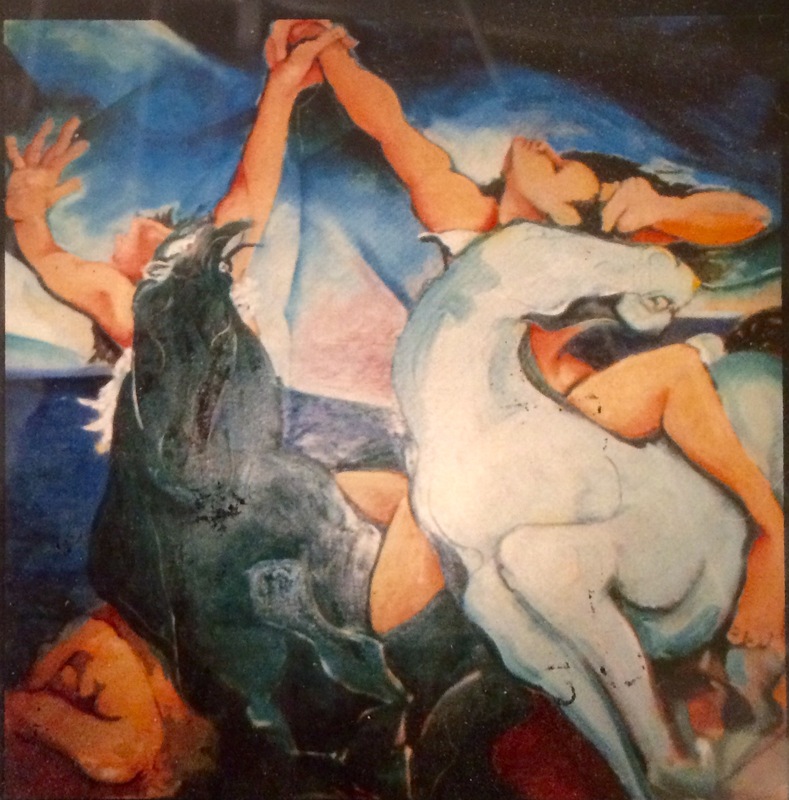 I lost track of this one and if you know where this painting is, let me know. Tripper Dog-Dog-Dog has moved through several names in his 3 years on earth. He has a cornucopia of names. For a while I dropped the “Tripper” part of his name and simply called him Dog-Dog. Now, much as a mother might use their child’s middle name, we only call him Tripper when he’s in trouble. Lately I call him Dog-a-Dog (or doggadogga). He answers to Wag-A-Wag. He is an Australian Shepherd and has a bobbed tail that never stops wagging. He is a happy, happy boy. When I let him out in the morning I call him Fuss Bucket. When he comes back in I call him Poop Sack (for obvious reasons) or Bark Monster or Fur Ball. He sheds like a champion. When he circles through the rooms of our house looking for a safe place to deposit his bone, I (cleverly) call him Bone. Language is a beautiful paradox. It is reductive even as it points to the unfathomable universe and the infinity of love. It is referential; we sometimes forget that the word “tree” is not the tree itself. It is merely an invented-phonetic-pointer toward something too complex to comprehend. Language is powerful beyond comprehension. We use it to narrate our worlds, both inner and outer. The words we choose create the world we see. The words we choose define the world we inhabit. In my consulting/coaching days I used to love playing with exercises that revealed how easily we come to the language of gossip and blame. It requires almost no effort. Like sugar, hate-speak is addictive. It is the mark of a lazy mind. The language of love takes some intention and consciousness. It demands conscious effort. It requires paying attention. It requires focusing the energy of the mind and, like any focus (or muscle) it demands exercise to be healthy. And, when exercised, it becomes easy. With great love, the word “Rubbish” can generate squeals of pleasure. The name “Fuss Bucket” will engender a full body joy-wag. And, a full body joy-wag will bring the love full circle. Love is like that. Joy is like that. In his many books, Martin Prechtel writes beautifully about the power and necessity of speaking beautifully. Speaking beautifully creates a beautiful thinker and a beautiful thinker creates – narrates – a beautiful story, a beautiful world.